Login (members of Judo NSW) or Click on "Click here to register" (for non-members of Judo NSW) for a full list of the class options. New Friday 'Todz Judo' class for 2-3 year olds. New Friday 'Graded ' Judo class for 7-10 yrs age group! The Kids Judo program at the University of New South Wales began in 1996 with 2 classes a week. We now have 23 classes a week in six age groups and over 230 children enrolled in each term. These classes develop the core skills of movement with the learning of basic Judo movements - safe falling - jumping - balance - contact awareness, as well as developing concentration and self confidence in a games structured environment. These games are developed to create the awareness of the desired skills of Judo with lots of fun and laughter. 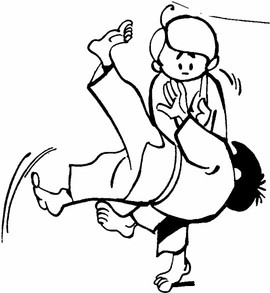 These classes develop the core skills of Judo - safe falling - balance - contact awareness. The classes are conducted in a games environment where the games are structured to create awareness of the desired skill. Big Ball Sumo, Pillow fights and Crash Mat battles are just some of the fun games the children play. These classes develop specific Judo skills but with high "game" element. Safe falling skills are more developed to increase the ability to relax during the fall. Gradings commence in this age group. These classes develop throwing and groundwork techniques with games designed to challenge the kids mentally and physically. The techniques taught are required for gradings. These classes develop throws, groundwork, techniques and overall body strength. Classes develop strategy with focus on competition depending on individual players maturity.